Powered by its very own Apex Engine, enabling it to boast beautiful, lifelike graphics and never-before-seen gameplay mechanics, the fourth game in the Just Cause series sees our boy Rico Rodriguez back at it again – this time answering to no one but himself. Three years after leaving The Agency, Rico has discovered that his late father had been working with the Black Hand, a mercenary group working on behalf of Mendoza and Di Ravello (the dictators that Rico assassinated in previous games). Rico has decided to make it his life’s mission to find the truth behind his father’s life and death. WellPlayed were honoured to be invited to attend a private preview of Just Cause 4, set to release in early December 2018. Welcomed into the homely, brightly-decorated Sydney studio of Bandai Namco, the team of journalists were shown the official release trailer of the game and given a presentation on the overall concept and gameplay mechanics. “I’ve become a huuuge advocate for Just Cause after working with number 4” announced Bandai AU Community Manager Joshua Graffeo as he hit the play button on the video and watched in awe with us, as excitedly as if it were his first time seeing it. Set in the fictional country of Solís (pronounced so-lease) in the South American region, The Black Hand – spearheaded by the main antagonist of the game Gabriela Morales – are in pursuit of a local rebel named Mira, and make it known that until they have her in their custody they will destroy the country and anyone who gets in their way. Though we don’t yet know why Gabriela is hell-bent on capturing Mira, it is made apparent that the two know each other quite well. Mira and Rico team up to rally the townspeople and build what they affectionately name their ‘Army of Chaos’ to defend Solís from Gabriela’s wrath. The more Black Hand team members, vehicles, and buildings you destroy, the more progress you make on your chaos meter (I may have made this name up after forgetting the real name of it), and once it fills up completely you are able to recruit new people to your army, and deploy them in your chosen areas of the map to defend the country, and you can also call on them when you need backup. The ultimate goal of the game is to take down the Black Hand’s Project Illapa (pronounced e-yappa) – whatever that is. This time around, moving away from the traditional concept of open-world single-player games like the previous Just Cause games, you don’t work your way through a main storyline as a lead-up to your face-off with Illapa and the Black Hand. Instead, much like the Grand Theft Auto series, you have the freedom to explore the world at your own pace and choose in which order you do the missions (known as Operations). You may attempt your takedown of Project Illapa at any time, but similar to entering a high-level zone as a level 1 character in an RPG, if you haven’t built up your skills and your arsenal of weaponry and rogue soldiers, you aren’t going to be making the Black Hand regret being born any time soon. 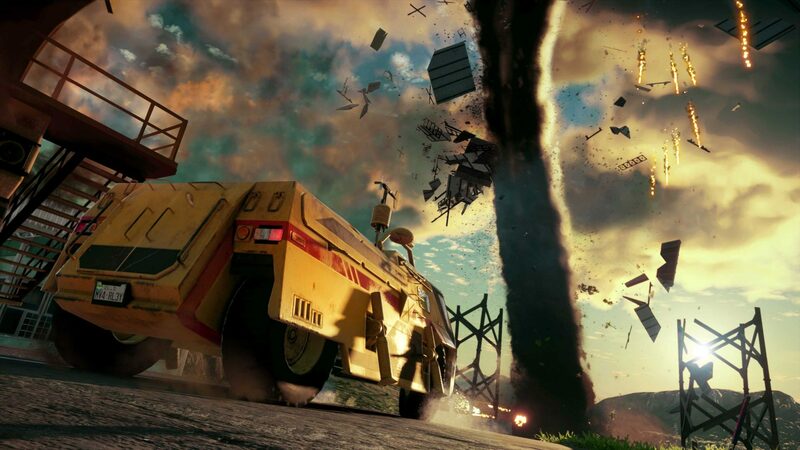 Just Cause 4 shakes up the traditional open-world gameplay by introducing an extreme weather system where natural disasters tear across the different biomes – tornadoes in the Grasslands biome, tropical thunderstorms in the Rainforest, sandstorms in the Desert, and blizzards in the Alpine. These use a powerful physics engine to calculate the storms’ paths in real time rather than having them follow a programmed path – meaning that no two storm paths – or the destruction to the interactive world surrounding them – are ever the same. The physics we all know and love from the Just Cause series return once again, with almost everything in the world being interactive in some way. 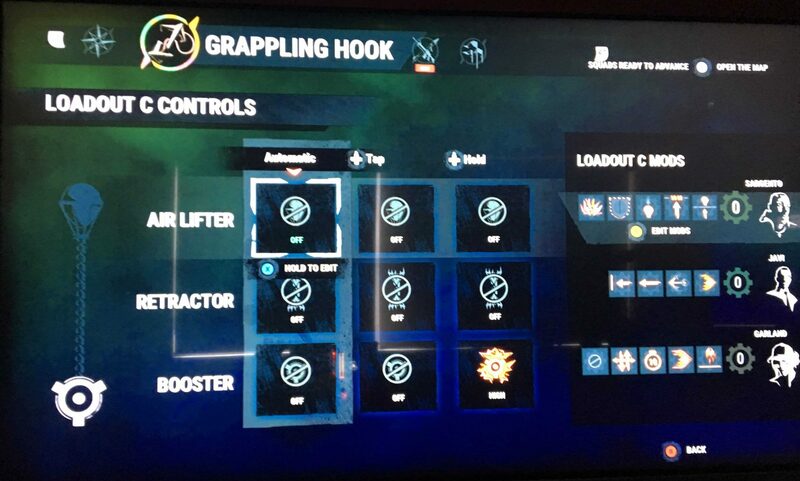 Of course it wouldn’t be Just Cause without the trusty grappling hook, and this time it’s back and on steroids. Boasting the traditional Spider-Man-esque scaling of buildings and mountains, the grappling hook is now fully customisable with modifications that change everything about it – the length of the grapple, the speed of retraction, what happens when the retraction is complete, the attachments such as boosters and helium balloons, the ability to change those helium balloons to a more explosive gas, the direction and strength of the boosters… it goes on…and on and on. Seriously – there are over 4,000,000 possible combinations of grapples and modifications, and no that is not a typo. Like music to our ears, we were told to take the controllers and wreak havoc in the game after having everything unlocked for us, and personally we think it would be rude not to do as we are told, so wreak havoc we did! We tested the grapple and different combinations of settings and mods for it extensively – attaching boosters to a merry-go-round and strapping people onto it, sending vehicles, small buildings, animals, and people into oblivion by attaching boosters to them, and even attaching enough helium balloons to a tank to make it float so we could fly around and shoot from it. Blazing through the map in a Hover Tank probably sounds a bit overpowered, but trust me when I say that the game is challenging enough that I still died just as many times as I do playing any other game that doesn’t let you fly ground vehicles of mass destruction. We confirmed with the Bandai crew that the game is able to be completed by playing normally, the extra stuff is just for a bit of fun on top of the main playthrough of the storyline. I think the most appealing aspect of the game is simply the fact that you are free to do what you want and aren’t forced into a new mission directly after completing one. I like to explore the map, find Easter eggs and do side-quests, so a free-choice game like JC4 is definitely something I’ll call in sick to work for so I can spend days undisturbed, finding new and exciting ways to disappoint everyone around me who still believes there is hope for me ever being good at games.